It’s easy to fall out of the habit of blogging. Eric Pickles has enticed me back to the keyboard. Communities and Local Government Minister Eric Pickles wants to tackle the menace of multiplying bins on our streets. He has called for new housing developments to include extra storage space for the clutter of wheelie bins that spill across many pavements. Pickles has a point. 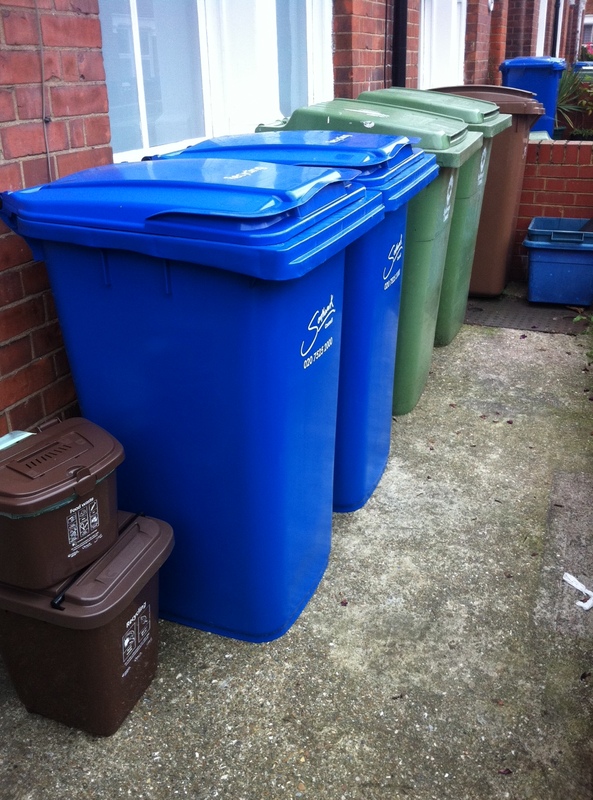 These attention-grabbing bright blue, green and brown boxes look terrible: why do bins have to be such a prominent part of the visual environment? Progress is all about hiding rubbish. We got rid of middens, stopped people throwing crap out their windows and pushed water waste into underground sewers. ‘In your face’ wheelie bins are a backwards step. That said, instead of calling for more room for bins, Pickles should be pushing for more room for people. Britain’s population now grows by 400,000 people a year. But in the twelve months to March, only 101,920 new house builds were started in England. Fast rising prices (and rents) are making large parts of the country – the parts that drive the economy – unaffordable. In London, houses now cost more than twelve times the average income. In the past, I’ve written about a ‘planning panic‘ that prevents us from having a sensible debate about where we’re all going to live in our increasingly crowded islands. This panic risks turning into paralysis: on housing, transport and energy we seem to be going nowhere. Planning Minister Nick Boles is doing his bit (and not winning many friends for it). It’s time his colleagues – and the Opposition – took the risk of starting a grown-up conversation about how we can find more room for people. This entry was posted in all kinds of everything, Planning, Planning Panic and tagged bins, Eric Pickles. Bookmark the permalink. until a government is straight forward and brave enough to launch a campaign for us to slow down on the breeding, the bins will remain one of a thousand balls to be kept juggling. …how come if you want to drive a car on a road,you have to at least study and work towards a driving license,yet if you want to be sproggin your way up the junction,there’s not a lot in place to stop anyone? What would the test be like, Mary? It took me three goes to get my driving licence…! y’fill in a wee form…i’m thinking reasonable signs of having shown the will to be a homebuilder….maybe the sow and the seer will have lived happily together for more than three months…any evidence/history of domestic violence should bring about council in order to discourage breeding for the now….those who’ve lived together happily for longer periods and contribute to their immediate community would go right to the top of the list for housing…it’s basically carrot and stick business….i’d like to see vending machines in tescos and school corridors with free dutch caps,coil information,and condoms. The applying for a licence thing made me think of the phrase ‘trying for a baby’ in a whole new way. Your criteria sound quite reasonable to me. I don’t know about Dutch caps – aren’t they a terrible fuss? i’m amazed it took you three goes to get your driving licence …if i was the instructor, i’d have just passed you for wee feel in the back of yer ford focus. It was a VE Polo ‘saloon’! how do you make a polo laugh?……TICKLE ITS HOLE!!! I have only just got this… around 42 hours later! I couldn’t get the Polo car out of my head – and then I was stuck on Poland. I wish you would do a Blogs Update, Mary. Without your blogs to guide my next steps my life lacks direction.